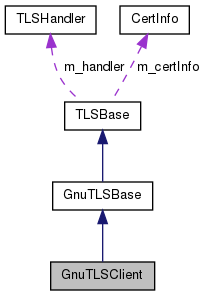 This class implements a TLS backend using GnuTLS. Definition at line 44 of file tlsgnutlsclient.h. Definition at line 24 of file tlsgnutlsclient.cpp. Definition at line 30 of file tlsgnutlsclient.cpp. Definition at line 34 of file tlsgnutlsclient.cpp. Definition at line 80 of file tlsgnutlsclient.cpp. Definition at line 89 of file tlsgnutlsclient.cpp.